Sonam Kapoor, is currently in a happy space with husband Anand Ahuja, a Delhi based businessman. The actress was in Delhi to walk the ramp for a leading jewellery brand on September 9, 2018. Anand was there to accompany her at the event. 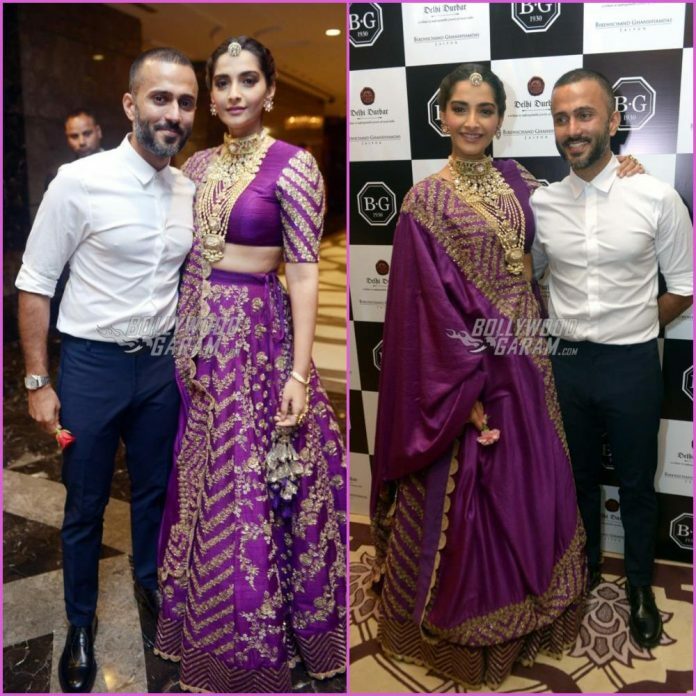 Sonam looked gorgeous in a purple lehenga choli with heavy jewellery to complete her look. Anand and Sonam as usual shared a great chemistry when they were together at the event. The two were all smiles as they posed for the cameras at the event. Sonam looked every bit like a suave and was seen gracefully walking at the ramp. Anand was constantly seen holding Sonam’s hand and her dupatta when together. The couple got married in a lavish yet private wedding ceremony in Mumbai on May 8, 2018. The wedding ceremony was one of the biggest Bollywood event of the year that was attended by the Who’s Who of the industry. Sonam and Anand have been in news since the time they were seen dating and spending time with each other.